If you read my One Room Challenge post last week you know that my decision to join in this go-round was a last minute one so I didn’t really have a plan other than to get rid of the much-hated mustard yellow accent wall tile. A problem I’ve always had while looking for inspiration for my kitchen was my navy-blue floor as I knew it had to stay as would the mid-grey counter top. This is an odd combo so finding inspiration was quite difficult. 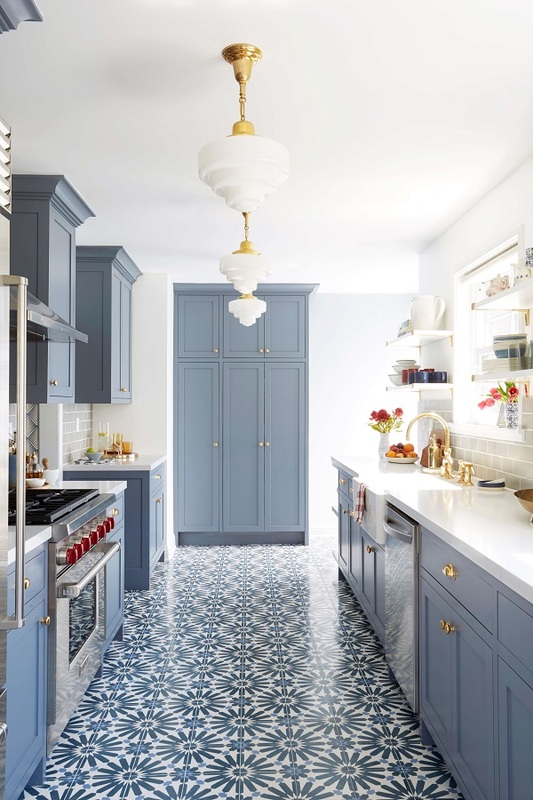 I saw the kitchen above on Emily Henderson’s blog and I was immediately smitten – Blue, grey, brass. Sigh – so pretty. Her floor is patterned cement tile, but the colours reminded me enough of my own space that I was inspired. I immediately plotted to replace the bottom doors on my cabinets with some shaker style doors in a blue-grey while keeping the more modern high-gloss white slab doors on top; update the backsplash, faucet and hardware. And then my imaginings came plummeting back to earth with a big splat. My kitchen is an older Ikea kitchen (their Akurum line, vs their current Sektion) so I couldn’t just go to and buy replacement doors in the store. I know there are a bunch of companies that now market ‘custom’ doors for Ikea frames - I did a little research, but sadly determined that replacing the doors is not currently in my budget given the shipping charges alone from one company were going to be at least $300 (and that didn’t include any doors, duty, taxes, or any other fees). I’ll be replacing the backsplash with white subway tiles. I still have to decide if I should go with white grout or maybe a light grey for some definition and to tie in with my counter. Given I’m planning on doing the tiling myself that decision will likely only be made after I’ve seen if I’m a good tiler or not – Ha! I’m updating my faucet with the Delta Trinsic faucet in Champagne bronze. Yes, I know every blogger has this faucet, but I like the look of it, so I bought it anyways. I want to update my kitchen hardware to something brass. We’ll see. I know it won’t be the ones in my mood board – these, the Mod-12 from Nest Studio Collection are $140 each. Since I need 17 these won’t happen which is really too bad as they’re so pretty! I need a new light. I have this West Elm Sphere light that I was going to put in my foyer, but it might work better here. I’ll need to inject some colour into the space, so I’m thinking about some art for the back wall, or maybe a colourful rug. I LOVE this piece by Leslie Weaver, but sadly it’s only 8x10 and I’ll need something bigger. My mom was in town last week and she helped me get rid of most of the tile!!! I want to say the space already looks so much better, but it truthfully looks a bit like a bomb went off. Therein lies some of the problems I alluded to in the blog title. I mentioned in last week’s post that my unit had been ‘flipped’ by a previous owner and they had done the kitchen. As we removed the tile it became apparent that they hadn’t properly prepped the walls before adding the tile. I expected the drywall paper to come off. What I didn’t expect was holes to appear as I removed tile that was affixed to improperly patched drywall. I assume the holes were from running the wiring, and they weren’t properly repaired (in some cases they were just ‘glued’ back in place around the edges with joint compound) . Some of the holes are smaller so shouldn’t be too difficult to repair, but there’s one above my oven which is about 10”square so I’m going to have to cut more out to find a stud before I can repair it. I'm not an electrician, but even I know that this isn't up to code. Another issue which I have to deal with is the wiring itself as I’ve always known that it’s a bit dodgy. 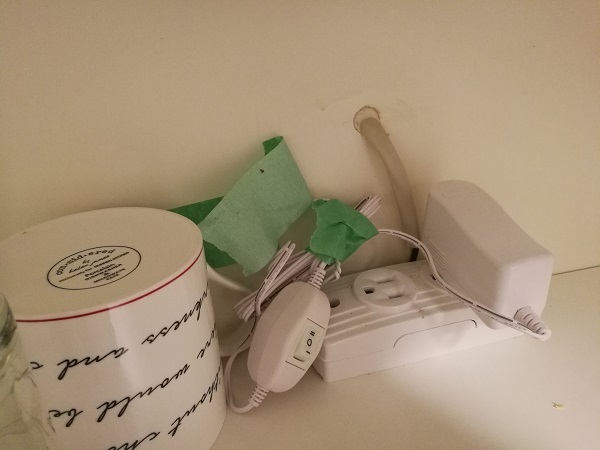 I don’t think anyone could look at the wiring in the picture above (this is what powers my under cabinet lights and is in the bottom of one of the cabinets) and think that it was up to code. 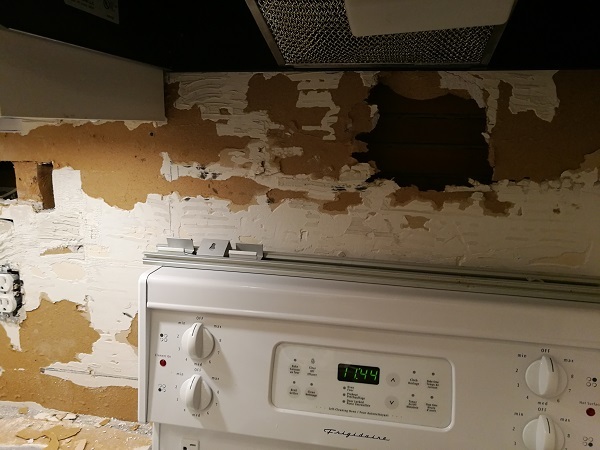 Since the backsplash is already off I’ve decided that I should get an electrician in to take a look and repair as needed. This is easier said than done – electricians are busy. I’ve finally got one coming over to take a look on Friday, and hopefully some work can get done soon so I can proceed with repairing my walls. A plumber is also coming because, as luck would have it, my hot water valve has sprung a leak. My last problem is self-inflicted. 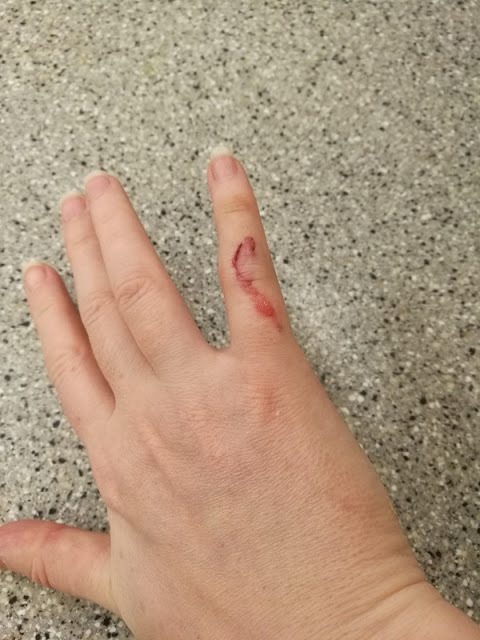 While removing the tiles I had one slice open my finger. Oh my god the blood. No, I was not wearing safety gloves so this is entirely my own fault. Learn from my mistake – always wear safety gear (gloves, glasses, shoes, etc) while doing any DIY. This is several days after the top of my finger was sliced off by a flying tile. PSA - wear work gloves! That’s it for week two. I’m hoping that my appointments with the plumber and electrician go well tomorrow so I can get started on repairing the walls and prepping them for tile. I’ve got tickets to go see Yakoi Kasuma: Infinity Mirrors at the AGO on Saturday so I’ll only have one day to work on the kitchen this weekend - hopefully I’ll be able to make some progress. Wish me luck! Your plan sounds great and you must be so happy to have the removal of the backsplash behind you! Check out Etsy for digital prints you can download and print locally....there are so many beautiful options that come in tons of sizes! Oh no! Your poor finger! You've made some good progress though and your mood board is lovely! Oh man, been there! It wouldn't be a One Room Challenge without setbacks. But you got this! Your plan sounds like a solid one & I'm sure it's going to come together beautifully. Best of luck with the plumber & electrician this weekend & fingers crossed that the road gets smoother from here! I never remember to wear safety gear, but the amounts of times I've hurt myself you'd think I'd learn! 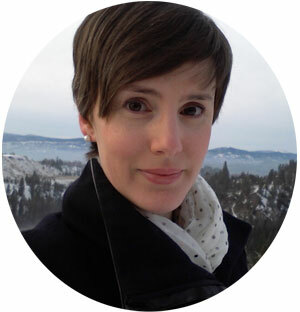 I love your design plan, and I can't wait to see how you figure it all out within your budget. Sorry about your finger! It never fails that something doesn’t go according to plan. Can’t wait to see the end result! Ahhhh, the pain of a reno project! My ceiling repair set me back last weekend, but we will make it! I love your inspiration and your plan is wonderful, I can't wait to see how your backsplash turns out! I am tiling floor this weekend. Fingers crossed for us both!! Yikes! That is a painful cut, hope it gets better quickly. Renovation is such a domino effect, right? I am so glad you are able to fix the issues and my fingers are crossed that all the extra issues are resolved quickly! Love where you are going with this in terms of the mood board. And I’m sorry about all the challenges you are facing- unfortunately I know most of these all too well! It's crazy how many things can come up just in week 2! Hope your finger is feeling better. We can relate to that feel all too well. Can't wait to see what happened this week. 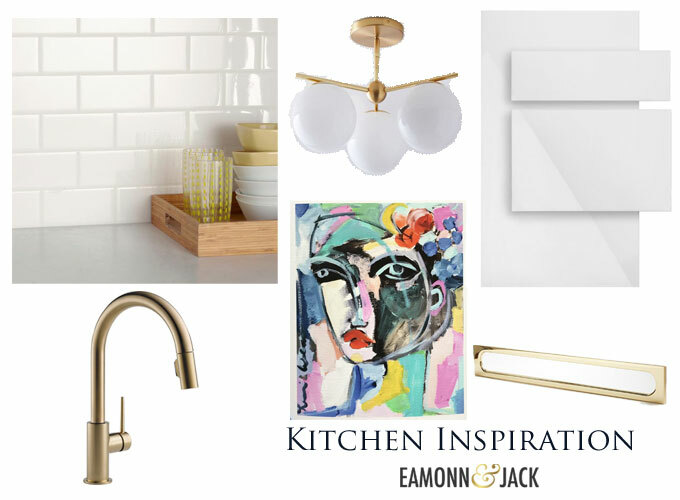 That inspiration kitchen is one of my faves. It's a great color combo! Hope your injured finger didn't slow you down this past week.